Fukasawa, my clean, simple and minimal theme inspired by the work of the MUJI designer Naoto Fukasawa, is now available for download. 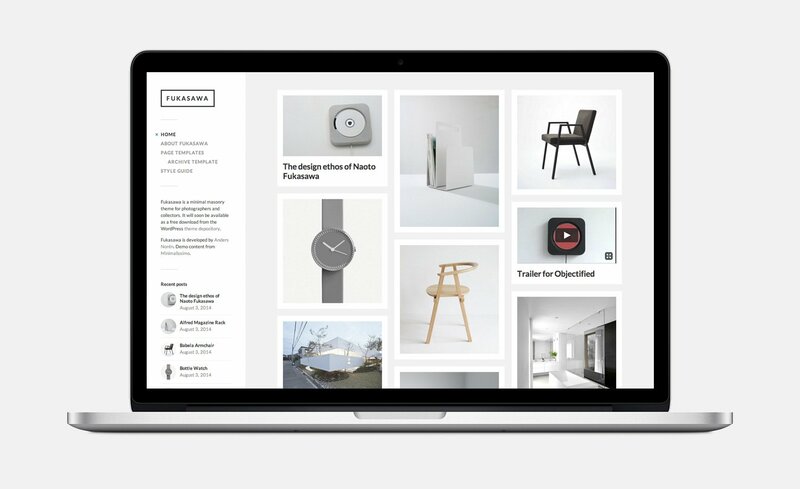 Fukasawa, my clean, simple and minimal theme inspired by the work of the MUJI designer Naoto Fukasawa, is now available for download on the WordPress.org theme depository. Fukasawa is a masonry theme built with the display of images, galleries and videos in mind. In addition to the clean looks, Fukasawa features responsive and retina-ready design, custom accent color, custom logo, Jetpack infinite scroll and tiled galleries support, five custom widgets, editor styles and translation-ready code. Fukasawa is the last of my summer themes to be released on the depository. I have been kicking around some ideas for new themes, but with school, work and life in general taking up my time and attention, I probably won’t be able to get to them before christmas. It’ll probably be good with a break. It’s been a crazy couple of months.